I don't do nearly the amount of modeling and texturing I use to. Now that I'm at a web company, I'm pretty much up to my eyeballs using Flash. 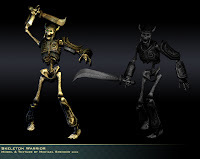 This fairly low poly skeleton warrior was one of that last things I created for the D&D project. Like in all MMO's (massively multi-player online...games,) you can't make it far without having to kill 100 rats. In the case of DDO, you can't go far into the caverns of the damned without cracking a few of these guys. Good times.